(GREEK NEWS AGENDA) Koufonisia is a cluster of two islands, Kato (Lower) and Pano (Upper) Koufonisi that belongs to the complex of Small Cyclades. 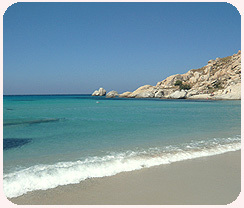 Geographically, it is located on the southeast side of Naxos and on the west side of Amorgos. Koufonisia also include the tiny, uninhabited island of Keros, which is a protected archaeological site from which a good number of ancient Cycladic art has been excavated in the 20th century. The main occupation of the locals is fishing, so Koufonisi is a true fish village where visitors may eat fish and seafood in abundance. It has one of the biggest fishing fleets in Greece. Its heavenly beaches – mostly sandy – are part of the magic of this picturesque island.